New book, 80 pages, SS5549. The Grumman OV-1 Mohawk was the first turboprop aircraft to enter into US Army service to fill the role of visual, photo and electronic reconnaissance. It was very unique in its design, and it never received the recognition for its accomplishments in over 40 years of service. Originally planned for both the Army and the Marines, the OV-1was used just by the Army, though NASA had a test aircraft for testing jet engine noise. Civilian users included the US Forest Service, the Environmental Protection Service and US Customs, which used the Mohawk to track drug traffic. The OV-1D aircraft from the 15th MI (military intelligence) and the 224th MI groups participated during Desert Storm, accruing over 5,500 flight hours with 2 planes lost. 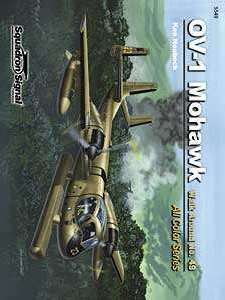 The Mohawk was retired from U.S. Army service in 1996. More than 150 photographs, line drawings, and 12 color profiles.